Oil pipes, boilers, pressure vessels, buildings, aircraft equipment and ships are just some of the products being quality tested using this technique around the world, and Myanmar’s Department of Atomic Energy is taking steps to spread its use, said Ingyin Phyu, the scientist in charge of the Department’s NDT laboratory. 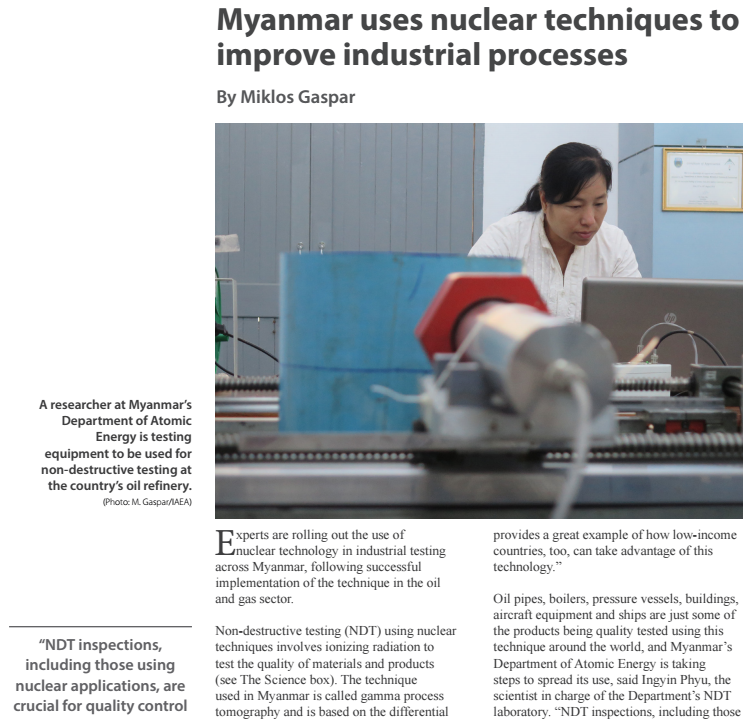 “NDT inspections, including those using nuclear applications, are crucial for quality control in a variety of industrial fields in Myanmar,” she said. Technical staff of Myanmar Railways, Myanmar Shipyards, Yangon Technological University and private companies have recently received training in the use of the technique and have already begun to employ it in a wide range of activities, including on construction sites, in dockyards, on locomotives and at the country’s largest amusement park. 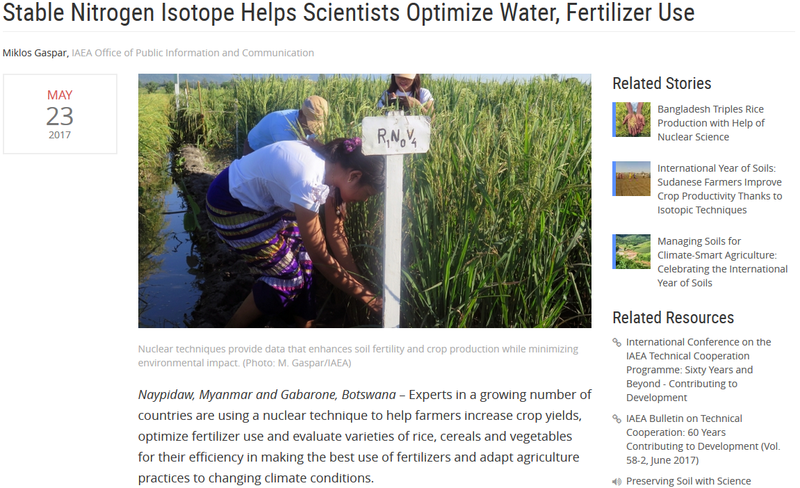 Naypidaw, Myanmar and Gabarone, Botswana – Experts in a growing number of countries are using a nuclear technique to help farmers increase crop yields, optimize fertilizer use and evaluate varieties of rice, cereals and vegetables for their efficiency in making the best use of fertilizers and adapt agriculture practices to changing climate conditions. 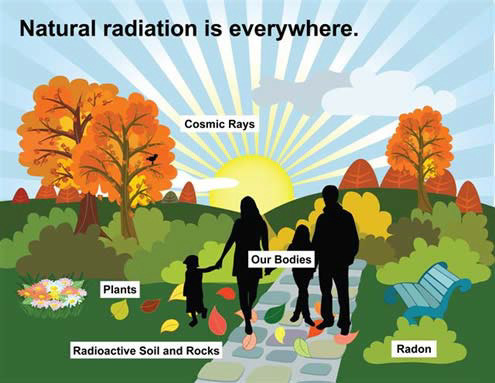 Research has shown that less than 40% of the fertilizer applied globally is taken up by crops, while the remaining 60% is either lost to the atmosphere or to groundwater, or is left in the soil in a form that cannot be taken up by the crop. 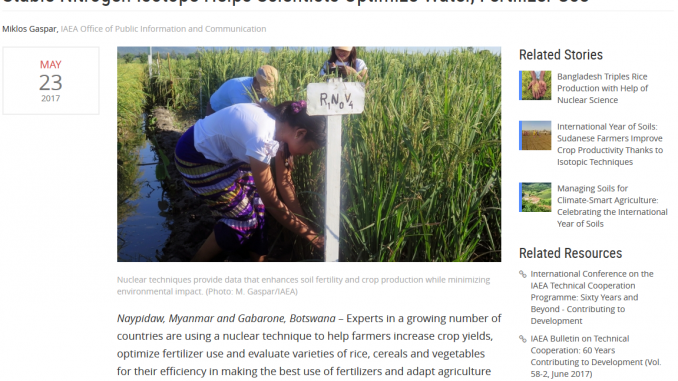 “We have cut fertilizer use by around a quarter on the half-acre plot where I tried the new rice variety,” said farmer U Kyaw Lay, from the central village of Thar Yar Su, Myanmar. “This represents an important saving for me and my family.” In the next growing season, Lay said, he will devote more of his land to this particular rice variety, which he said was also tastier than the kind traditionally used.